The root tuber of perennial herbaceous plant Curcuma Longa L. of family Zingiberaceae. Specially fragrant, bitter and pungent taste. Firm, golden cross section, dense fragrance. Pungent, bitter; warm; liver and spleen meridians entered. Activate blood and move qi, dredge meridians and alleviate pain. 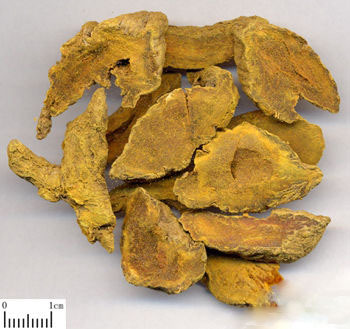 This herb has the actions of activating blood, moving qi and alleviating pain. It is indicated for pain of heart, chest, hypochondria and abdomen due to qi stagnation and blood stasis, traumatic injuries, swollen and pain due to stasis, and gynecological diseases such as mass, amenorrhea, dysmenorrhea, irregular menstruation, postpartum abdominal pain and so on. In addition, it can activate blood and dissolve stasis, relieve carbuncle and swelling, and alleviate pain, so it is externally indicated for sores, abseess, carbuncle and swelling. For pain of heart and abdomen caused by qi stagnation and blood stasis, it is combined with blood-activating and qi-moving analgesics such as Dang Gui, Mu Xiang and Wu Yao, etc. For dysmenorrhea, amenorrhea and postpartum abdominal pain due to qi stagnation and blood stasis, it is combined with Dang Gui, Chuan Xiong and Hong Hua in Jiang Huang San from Sheng Ji Zong Lu. For traumatic injuries, swollen and pain due to stasis, it is combined with Su Mu, Ru Xiang and Mo Yao in Jiang Huang Tang from Shang Ke Fang Shu (Book on Traumatologic Prescription). This herb is pungent with actions of dispersing and warming to achieve dredging action. It can dispel wind-cold-damp pathogens externally, move qi and blood internally, dredge meridians and activate collaterals, excelling at dredging arms and limbs to relieve arthralgia. For shoulder and arm pain, and wind-cold-damp arthralgia, it is usually combined with wind-damp-dispelling herbs and blood-activating herbs such as Qiang Huo, Fang Feng and Dang Gui. Decoct 3~10 g. Proper dose for external application.